Penelope Ward has such a great ability to tell a story and this another great example of that talent! Heather and Noah have quite a unique journey, one that made me laugh and made me feel and definitely surprised me! I really felt like this story shows that true love can come in unexpected ways! Heather is young and working hard to support her mother who suffers from depression. She’s given up a lot to take care of her mom and she’s a pretty awesome person! To help with income they rent out the boat house by the lake and when she meets the man who rented it, everything changes! Noah is hot and smoldery and everything Heather could want, too bad he seems to want nothing to do with her. Over the summer these two get to know each other and build a friendship, there’s attraction but it doesn’t seem to be going anywhere. There’s an age difference and life experiences between them but Noah has some secrets about why he at the boathouse and it changes everything. I don’t want to spoil anything about this book, but this one definitely surprised me! I absolutely adored Noah, there is so much heart in this man and the things he goes through, oh my heart! Heather, she’s quirky and something else, sometimes she made me a little crazy but I couldn’t help but love her too. These two don’t always seem like the couple you’d imagine together but in the end, their love is a thing of beauty! I definitely enjoyed this book and fell in love with these two, and the way their story comes together is perfection! Another great read from Ms. Ward! 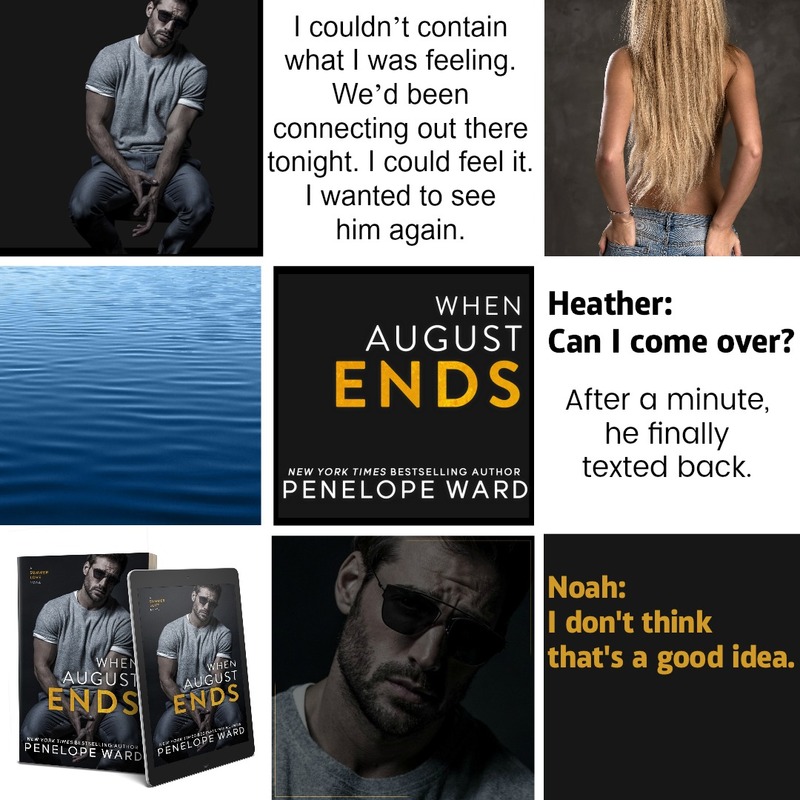 We are excited to share the Excerpt Reveal for When August Ends by Penelope Ward! Definitely excited about this book and she’s sharing the first two chapters! Happy Friday! 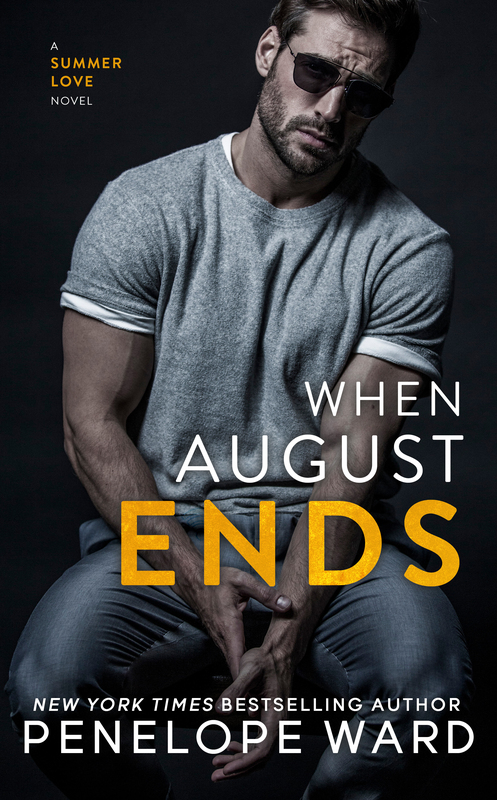 We are excited to share the Cover Reveal for When August Ends by Penelope Ward and oh this cover is HOT! Definitely looking forward to this book!! We are so excited to share the cover for Hate Notes by Penelope Ward and Vi Keeland! I already love this cover and am excited about the book too! We’ve got a great one to share today – Love Online by Penelope Ward is live and a must read! I loved this book and Ryder – oh he’s so swoon-worthy! I hope you’ll check out my review and this great book! Oh my Ryder! Penelope Ward has done it again! Love Online is a bit different and these characters certainly meet under different circumstances and don’t have a traditional romance but their story definitely worked for me! I think Ryder is just amazing and totally swoon-worthy and Eden is so sweet and love-able. This was a fun read, without a lot of unnecessary drama, as Eden and Ryder try to figure out if they can make their relationship work. These two have a great connection, even if they found it in an unconventional way. Ryder and Eden have very different lives and yes they find love together, but the real test is whether they can find a way to connect their lives and their love. I love the way Penelope Ward can deliver a story, and Love Online hit all the marks for me. It made me laugh, cry and fall in love! RUSH – that is all! We are thrilled to be a part of the review tour for Rebel Heart by Penelope Ward and Vi Keeland! Rebel Heir and Rebel Heart are absolute must reads – I hope you’ll check out my review! Penelope Ward and Vi Keeland just rocked my world, and my heart! If you haven’t read Rebel Heir – you must read that first, plus it’s fantastic because Rebel Heart picks up right where that book ended. Right into the action and drama and ANGST! I’m trying to do this spoiler free but man this one got to me! I felt like I spent half this book holding my breath, just waiting to see what was going to happen. I love these characters, Gia and Rush own me! I understood their struggles and the push and pull, their situation is rough for sure. These two are so strong though and so is their love. I was rooting for this couple and I loved the way it all came together. I loved both of these books and their journey, Gia and Rush are amazing and prove how strong love can really be. The perfect amount of laughs, tears and angst! Vi Keeland and Penelope Ward have written some of my favorite stories and I’m adding Rush and Gia to that list!